Peerless Blowers Backward Inclined Belt (B) blowers are available in 13 sizes ranging from a 10-1/2 to a 36-1/2″ wheel, in AMCA class 1 and 2. Wheel sizes 27″ and larger are standard with airfoil wheels. The CFM range is 509 to 30,640 with up to 8-1/2″ static pressure. The fans have easy installation and maintenance. The self-contained packaged fans allow for easy access to the motor, drive and bearings for ease in installation, lubrication, belt adjustment and wiring. The backward inclined fans are designed with a heavy-duty housing and base. The wheels are dynamically balanced and supplied with cast iron hubs. All fans are available in either clockwise or counterclockwise rotation and the housings are rotatable up to 8 different positions. All of the backward inclined fans are available with either single or three phase motors in a variety of enclosures. 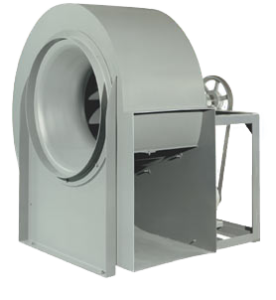 All backward inclined fans are tested in accordance with AMCA codes and standards.